Common Names: Round-leaved sundew; common sundew. Drosera rotundifolia is a carnivorous plant which traps insects by its sticky tentacles and then extracts nutrients from their bodies by dissolving them with enzymes. When potentised, Drosera becomes a significant homeopathic remedy for various types of coughs, and especially whooping cough. In addition, it’s a useful remedy for types of bone or “growing” pains and breathlessness, both of which are worse after midnight. 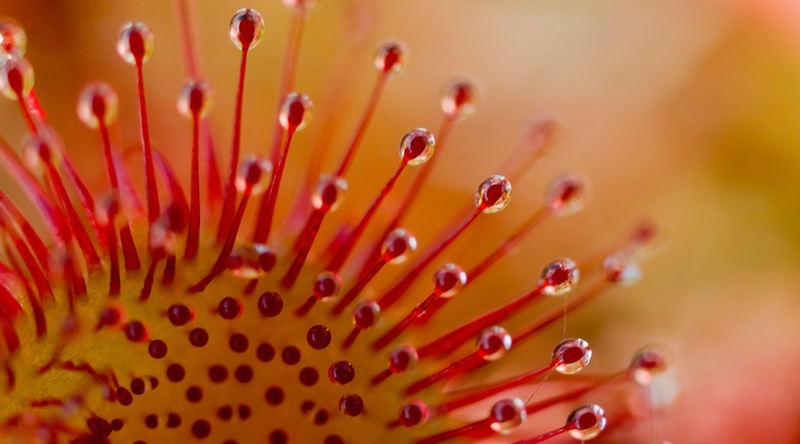 Those who need Drosera may also have a family or personal history of tuberculosis. Feels persecuted by others, or that others can’t be trusted. Cough as soon as head touches the pillow. Unable to catch breath with cough. Cough with retching and vomiting. Cough so severe that it triggers nosebleeds. Constriction in throat on talking. Cough from irritation in the larynx. Asthma with a history of tuberculosis. Spasm in fingers when grasping something. Joint problems or joint pain when other Drosera symptoms also present. Cough with gagging or retching. Drosera rotundifolia (Dros.) is available from our online store as a single remedy, and as part of the following Complex (combination remedy): Cough – Dry.